Those Jets heritage jerseys are a thing of beauty. Compared to those garbage aviator jerseys, these are in a class of their own. If the Jets do anything right in 2019, they'll scrap the aviator jerseys - especially since the Jets are 4-4-1 in them - and bring in a blue version of this heritage jersey. By the way, the Jets beat the newly-equipped Edmonton Oilers 4-3 tonight, so the local squad can at least claim they finished the year off with a win. Here's to 2019, folks! All the best if you're out this evening, be safe, and please don't drive if you imbibe. We'll kick off a new calendar year tomorrow, and everyone is invited back! Until 2019, keep your sticks on the ice! I was all set to write a preview piece on the Spengler Cup Final tomorrow between Team Canada and the surprising Kuopio KalPa team from the Finnish Elite League. I was set to talk about goaltending and where theses teams shine in bettering their opponents, but all that was stopped when the guy in the lede photo decided to get his value out of the last page on the monthly calendar today. 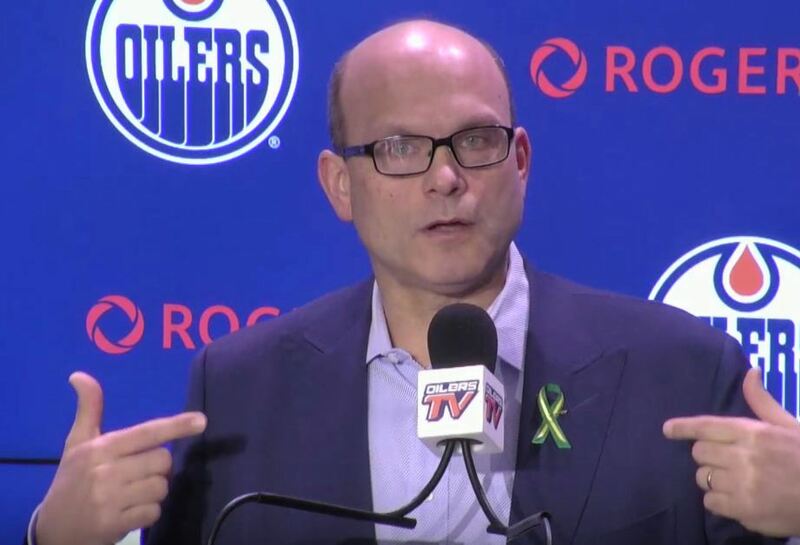 In what can only be described as inexplicable moves, Edmonton Oilers general manager Peter Chiarelli dove back into the trade market today to improve his team. If one isn't aware, the Oilers are currently without Andrej Sekera (achilles), Oscar Klefbom (hand) and Kris Russell (groin) as all are injured. That's enough to decimate any defensive unit, so Chiarelli decided to get creative to help solve his defensive woes. Remember, he's trying to improve his team in the short-term while some of these players recover from their injuries. In a mid-afternoon move, Peter Chiarelli called up Florida Panthers GM Dale Tallon in an effort to improve his blue line. While I'm sure names like Ekblad, Yandle, and Matheson were mentioned, the two men came to an agreement that sent Alex Petrovic from the Panthers to the Oilers for Chris Wideman and the higher of the two third-round picks that the Oilers own in 2019. Petrovic arrives in Edmonton with a single assist in 26 games while Wideman had two helpers in five games with the Oilers following his acquisition from the Senators where he tallied two goals and three assists in 19 games. Again, the Oilers are looking to improve here. Keep that in your mind after reading this next decision. Chiarelli, not done there, decided to give Chicago Blackhawks general manager Stan Bowman a call next. Again, Chiarelli likely tossed out names Forsling, Murphy, and Jokiharju as the discussions went along, but he and Bowman finally settled on a deal that sent winger Drake Caggiula and defenceman Jason Garrison from the Oilers to the Blackhawks in exchange for defenceman Brandon Manning and defenceman prospect Robin Norell. Norell is currently playing for Djurgårdens IF of the Swedish Hockey League where he has three assists in 28 games. Just so we're clear, the Oilers sent eight goals and four assists to the Blackhawks for one goal and two assists. "I did all I could defending him last year in the media," McDavid said after Edmonton's 6-5 loss to Philadelphia at Wells Fargo Center. "Everyone wanted to make a big deal saying he did it on purpose, and he wanted to say some comments today about what went on last year. I thought it was one of the [most] classless things I've ever seen on the ice. He said some things, and our guys responded accordingly. I guess we can put the whole 'if he did it on purpose' thing to rest because what he said out there kind of confirmed that." And now Manning and McDavid are teammates because Peter Chiarelli needed to make a deal to acquire a bottom-pairing defender in exchange for one of McDavid's best friends on the team in Caggiula. What makes this entirely worse is that the major media outlets in Edmonton are out there protecting Chiarelli on this one when they should be eviscerating him. For those questioning the Brandon Manning acquisition, we can report that GM Peter Chiarelli received Connor McDavid's blessing on adding the D-man involved in the collision that broke McDavid's collarbone back in 2016. It's notable considering the trade, but the Manning McDavid thing will not be an issue. Both are professionals, and I'm sure they'll laugh it off and move on tomorrow as teammates. Stuff happens in hockey, they get over it. Does anyone here think that Cam Neely and Ulf Samuelsson laughed off the knee that Samuelsson delivered that basically ended Neely's career? Does anyone here think that Marc Savard laughed off the vicious check he received from Matt Cooke that ended his career? Does anyone actually believe that Steve Moore and Todd Bertuzzi will ever laugh about the time Bertuzzi ended his career? McDavid's career, thankfully, is not over, but when a guy hints at the fact that he tried to intentionally injure you, I'm pretty sure that getting one's blessing for a trade is more about MacDavid wanting to improve the team and less about any sort of forgiveness for the guy who tripped McDavid into the boards where he broke his collarbone. Seriously, what are you thinking when writing that, Rishaug? Had the Oilers stopped at Petrovic, I could stomach that deal. Yes, they gave up a third-round pick they probably could have used on a defender in order to add some size and toughness to the blue line in a few years. Wideman wasn't going to set the world on fire in Edmonton by any means, but he was a serviceable defenceman with a touch more offence that Petrovic will bring. Ken Hitchock likes having a couple of defenders who can go out and play the heavy game, and Petrovic fits that mold without having to wait those years for a defender to develop in the "what have you done for me lately" NHL. However, it's unfathomable that the Oilers traded a solid winger in Caggiula with a player who likely would have been placed on waivers in Garrison for a guy who has been spending time in the press box in Manning and a guy who likely will never play in the NHL in Norell. I keep seeing the rationale for these deals as Chiarelli paying a high price with GMs who won't throw him a lifeline, but isn't the reason they're in this situation because Chiarelli's asset management is some of the worst seen in the past decade of hockey? If there's a bonus in all of this, the Oilers also announced they were recalling Joseph Gambardella, the leading scorer from the Bakersfield Condors, to fill in the roster spot opened through these deals. He was a solid player at UMass-Lowell and has looked good in his time with the Condors, but he'll really need to step up his game under the watch of Ken Hitchcock. If there's a guy who looks like he might be ready in the Oilers' system, Gambardella is the closest to being ready from what I've seen. As for Peter Chiarelli, this is just another example of poor asset management when it comes to maximizing returns in any deals. He whiffed on the Larsson-for-Hall deal, he saddled Edmonton with Lucic's albatross contract, he signed Draisaitl and Nugent-Hopkins to deals they are repeatedly proving they aren't worth unless they play alongside McDavid, he traded Jordan Eberle for Ryan Strome for Ryan Spooner which hasn't worked in any of its returns, he has Cam Talbot locked in as Edmonton's backup at $4.1 million, and since 2015 when he was hired the Oilers have made the playoffs just once. Instead of getting McDavid's blessing on a deal, Chiarelli should be begging for forgiveness in wasting the prime years of one of the best players to ever suit up in the NHL. He has given McDavid just enough talent for McDavid to showcase his talents, but surrounded him with players who likely should be in the AHL at best. The depth scoring and the blue line are often missing in action while McDavid has to be otherworldly for this team to even be competitive most nights. And that's simply not realistic or fair to McDavid. Based on his last three seasons of work, it would be hard to find anyone else in the NHL with Peter Chiarelli's resume who has done a worse job in constructing a team. He may just be the worst GM in the NHL. I was out tonight enjoying the company of some good friends, and the establishment that hosted our celebrating featured the Canada-Czech game from the 2019 World Junior Championship. We were having more fun that watching the game, but I don't think any of us really felt that the Czechs presented much of a threat to Canada, especially after the Canadian squad had been called out by head coach Tim Hunter yesterday and earlier in the day. When the final horn sounded, Canada skated to a 5-1 victory and all was right in the world. I need to confess something here: I'm a bad Canada fan. During a discussion with a couple of co-workers prior to the Christmas break, I admitted that I care not for the World Junior Championship preliminary games until the New Year's Eve game for Canada when the Canadians usually face their stiffest test from a rival like the USA, Russia, or Sweden. As with this tournament, Canada started with weaker teams as a tune up for Russia which will happen Monday night. Where I may be mistaken in my approach is that the other pool of teams has had a couple of incredible games featuring Sweden, Finland, and the US, and tonight's game between Sweden and the USA might rank as the best game of the tournament. The first two periods-and-a-bit drew nothing but yawns from the group of us watching from our table as Sweden jumped out to a 4-0 lead through 43 minutes. The Tre Kronor appeared to be firmly in control of this game while the Americans may be looking ahead to their battle with Finland. Instead, the remaining 17 minutes of the third period was an incredible display of relentless tenacity and incredible skill that left a number of us at our table with our jaws agape. It seemed that the Americans needed a miracle to overcome the aggressive forecheck of the Swedes, and they got their first break midway through the period when Minnesota-Duluth defenceman Mikey Anderson scored a power-play goal with 10:26 to go to make it 4-1. We, at the table, kind of shrugged our shoulders and agreed that three goals in ten minutes against the Swedes seemed a little far-fetched considering that Sweden had won 46-straight preliminary games. Following that, the Americans used another power-play to cut the deficit to two goals as St. Cloud State's Ryan Poehling converted an Alexander Chmelevski pass with 6:35 to play, and there was some chatter that maybe the Americans could rally if they somehow found another couple of power-plays in the last six minutes. With 37 seconds left, all of our eyes were affixed on the televisions when Poehling scored with 37 seconds and the goaltender on the bench to play to make it a 4-3 game. What seemed like an unthinkable possibility was within reach if the Americans could somehow find one more goal in the final 37 seconds of play. Ryan Poehling completed the natural hat trick with a goal with 23 seconds to play after Sweden failed to clear the puck from their zone, and the Americans had forced overtime with a rather remarkable four goals in ten minutes against a team that looked virtually impervious thus far in the tournament. For the first time in several years of tournaments, the Swedes suddenly looked very beatable as their 46-game win streak was in serious jeopardy. Overtime was a rather incredible display of skill as both teams showed all sorts of dangles, dekes, two-on-one attacks, and an offensive flair that this tournament had been missing as the Americans and Swedes traded knockout punches only to be denied by the incredible goaltending of Sweden's Samuel Ersson and USA's Kyle Keyser. As the teams traded odd-man rushes back and forth, it felt like it was only a matter of time before one of these teams capitalized on a chance. Adam Boqvist, who started the two-on-one with a pokecheck, took the return pass from Lucas Elvenes and rifled the puck past an outstretched Keyser at 3:51 of the overtime period to give Sweden the victory and preserve the amazing Sweden win streak! There wasn't a lot that Joel Farabee, the lone American back, could do once Elvenes one-touched the pass back to Boqvist, and Keyser had to respect Elvenes' shot on the two-on-one. 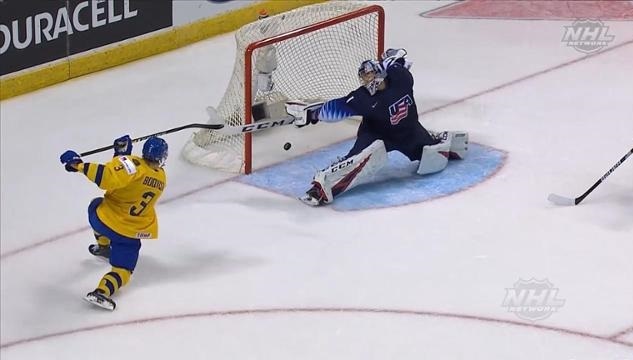 A rather remarkable game highlighted by the American comeback was ended on a perfectly-executed two-on-one by the Swedes. Here's the rub: I likely wouldn't have watched this game had I been at home. I likely would have found something else to watch because, as stated above, I am a bad fan for not caring about the preliminary games. The preliminaries are, for the most part, nothing more than the flirting of teams to find their pairings prior to the big dance. This flirting allows for teams to find their seedings without much risk unless a team goes winless and is headed to relegation. Once pairings are formed and we get to the important games, those are the games I usually start really watching because they mean something in the bigger picture. Tonight may have been a bit of a wake-up call for me as two of the best World Junior Championship programs put on one heckuva show in a game that might be the best of the tournament. Expect me to tune into the remaining preliminary games as the 2019 World Junior Championship progresses so I don't miss another fantastic game like this one! Despite scoring today, Daniel Winnik looks all business on the ice as Canada was giving the business end of a 6-2 decision to the DEL's Nurnberg Ice Tigers. Canada has looked every bit like the favorite they've been called in this Spengler Cup tournament as they dispatched the host HC Davos on Wednesday in a physical game, and now they'll await the winner of the quarterfinal game tomorrow before taking the ice on Sunday to see if they can defend their Spengler Cup championship from one year ago. It seems that every year that Canada does well, they get scoring from all over the lineup. This year's version is no different as seven different goal scorers have tallied markers on the eight total Canada goals thus far. Only Dante Fabbro has more than one goal in the tournament, and the Nashville Predators prospect has looked dangerous every time the puck is on his stick. On top of that, Canada is getting elite goaltending compared to their opponents from perennial ECHL netminder Zach Fucale. It's encouraging to say that while Fucale was called on to make a number of key saves in their game against Davos, it seems the defence had really locked in on what they have to do in helping Fucale be successful. With names like Bieksa, Wiercioch, Depresm, and Quincey, the NHL experience of this Canada defence can't be overlooked. With the 6-2 loss today, Nurnberg falls to 0-2 in the tournament and will occupy the third-place spot in the Cattini Division, meaning they will cross over to play the second-place team from the Torriani Division who will be the KHL's Metallurg Magnitogorsk. Davos, having posted a 1-1 record in the Cattini Division, will play the Czech Extraliga's HC Ocelari Trinec who finished 0-2 in their two games in the Torriani Division as the quarterfinal games are set. HC Ocelari Trinec has to be disappointed with their efforts as they looked outclassed by the Finnish Liiga's Kuopio KalPa one day after dropping a shootout decision to Metallurg to open the tournament. The best team from the Czech Extraliga showed some good play in that game against Metallurg, but they looked sluggish on the second-half of the back-to-back games against KalPa. They'll need to play well against Davos if they hope to salvage this tournament as the hosts never take a game lightly, but it goes to show that no one is out even if they play a bad game in the round-robin. I'm also curious to see if Metallurg will dress some of their stars who have sat for the two preliminary games thus far. Sergei Mozyakin has yet to dress, and I know there are people in the stands at Davos who want to see one of the KHL's living legends on the ice for the Russian squad. Goaltender Vasily Koshechkin has yet to dress as well, and the Russian Olympian likely would change how teams prepare for Magnitka. That being said, Artyom Zagidulin has played extremely well for Magnitogorsk, so perhaps the change is unnecessary as the team looks ahead to their KHL schedule which resumes on January 5. As it stands, Canada will play next on Sunday against the winner between Nurnberg and Magnitogorsk while Kuopio KalPa awaits the winner between Trimec and Davos. TSN will carry all of these quarterfinal and semifinal games with the Spengler Cup Final going Monday morning at 7:10am CT.
Will Canada repeat as champions? Right now, it seems like they'd be the favorite if one was looking to place bets. The Hockey Show, Canada's only campus-produced radio show that strictly talks hockey, returns tonight after all the festive dinners and celebrations have been put to rest. I hope the time spent with friends and family while eating some delicious food and opening unique gifts was as memorable as can be as Beans and I roll back into the studio tonight with another episode! You're probably sick of hearing Andy Williams' "It's the Most Wonderful Time of the Year" by now and I'm pretty sure you never want to hear Pitbull's "Don't Stop the Party" ever again after Canada's drubbing of Denmark last night, but we have hockey to discuss and we'll look at the two biggest tournaments happening right now! Let's be honest here for a second when I say that the World Junior Championship preliminary games are, for the most part, a joke. With the exception of the New Year's Eve game for Canada, should anyone be shocked that Canada has a fluff schedule to start this tournament like they do every year? In saying that, I spend most of this week focusing on the Spengler Cup where each win and loss carry some weight when determining when and who each team will play in the medal round. 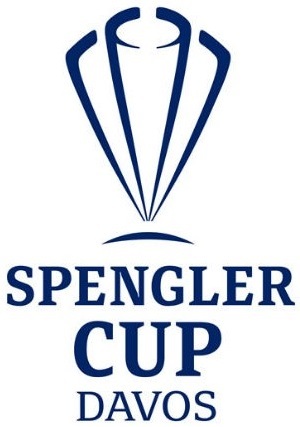 Tonight, Beans and I will go over some of the Spengler Cup information from the past two days, try to figure out why Zach Fucale's performance at this tournament never translates into chances in North America, and exactly who Canada will likely face in the semi-final. We'll also look at the World Junior Championship results from the first day-and-a-half, get everyone set for the Jets and Flames tonight as the two Western Conference division leaders clash, and we'll have a quick discussion about the Hurricanes wearing the colours of the Whalers. I also believe I said I'd be doing a giveaway tonight for some shwag, so make sure you tune in at 5:30pm CT! You might be wondering where the blurb about the UMFM app has gone. I'm going on record to say you can still use it, but the new UMFM website will fill the needs of our listeners because the new online streaming player is pretty awesome. If you're using an Apple device, the player doesn't seem to like Safari, but we highly recommend you use the TuneIn app found on the App Store. The UMFM app will currently work for you, but there's some work being done to realign it with UMFM's new website, so it may go silent soon. If it does, TuneIn. It's a solid app. I'm changing up the social media portion as well. I'm losing faith in Facebook, so that option will slowly be allowed to drift off into the horizon. However, the other options still work! 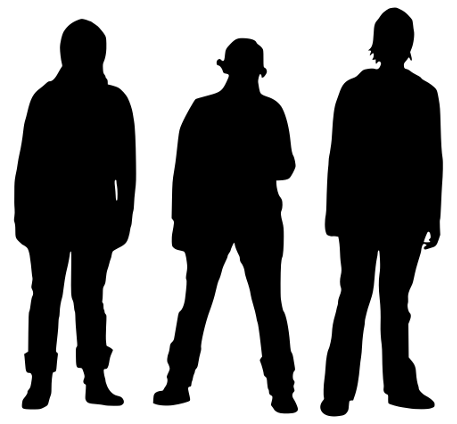 Email all show questions and comments to hockeyshow@umfm.com! Tweet me anytime with questions you may have by hitting me up at @TeebzHBIC on Twitter! We're here to listen to you, so make your voice heard! Tonight, Teebz and Beans go over the Spengler Cup, the World Junior Championship, the battle of the NHL division leaders, why the Hurricanes should never be associated with the Whalers, and much more only on The Hockey Show found exclusively on 101.5 UMFM, on the UMFM app, on the UMFM.com web stream! Where The Bieks-Have You Been? 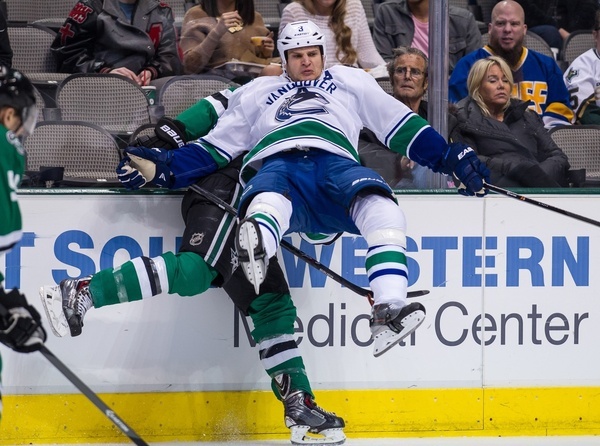 Kevin Bieksa, seen here casually reclining against a Dallas Stars player, has always been a physically dominant force while on the ice. He didn't throw as many devastating hits in his career as a Scott Stevens, but Bieksa knew how and when to deliver some physical punishment on opponents. From his time with the Manitoba Moose after the Canucks brought him in on a professional tryout contract, it seemed his brand of physicality was destined for the bright lights of the NHL. After 13 seasons in the NHL, Bieksa found himself this summer without a contract and looking for work. Far from being retired at age 37, Bieksa decided to change it up a bit in order to showcase his talents. While there weren't a ton of options, Bieksa decided to give Sean Burke and Ron Francis a call and offer his services to Hockey Canada for the 2018 Spengler Cup which began today. After seeing other players such as Curtis Joseph and James Wisniewski find work after a Spengler Cup appearance, Bieksa committed to the team for the week-long tournament in Switzerland. You'd have to believe that a number of the players from the other five teams knew about Bieksa's phyiscal brand of hockey, but it seems that HC Davos' Andres Andres Ambühl decided to ignore the warnings about Bieksa while trying to play his own brand of hockey. The result? See below. Holy cow, that was a hit. Clean, zero injuries from the hit, and thrown beautifully by the former NHL defenceman. For the record, Ambühl was fine on the bench moments later and played the remainder of the game after making the highlight reels across Canada by being the recipient of that hit. It should be noted that outside of the big hit thrown by Bieksa, it took an outstanding effort from Zach Fucale and the defencemen for Canada to withstand a fired-up HC Davos team in the third period to hold on for the 2-1 victory. With the win, Canada gets a day off before battling the Nürnberg Ice Tigers of the Deutsche Eishockey Liga on Friday while Davos will meet the German Elite League team tomorrow afternoon. On the other side, it took a shootout for the KHL's Metallurg Magnitogorsk to squeeze past HC Ocelari Trinec of the Czech Extraliga by a 2-1 score, so Trinec will meet Kuopio KalPa of the Finnish Elite League tomorrow morning while Metallurg prepares for their meeting with the Finnish squad on Friday. The Spengler Cup is always one of my favorite tournaments of the year, and Bieksa seems to be enjoying his time in Switzerland this holiday season as well! No post today, folks. Enjoy the day with family and friends. We'll pick everything up tomorrow and go from there. It's Christmas eve, and there's very little hockey news to report on this day other than there is no hockey news to report. Yes, Canada is getting ready for the 2019 edition of the World Junior Championship while others are looking forward to the 2018 Spengler Cup, but tonight is a night where hockey really fades to the background as we prepare for a day of giving and sharing tomorrow. It's a day where family and friends mean more than the gifts one may receive, where generosity is often a highlight when it comes to selfless acts of giving, and where the "intangibles" of the season - health, happiness, and the goodwill towards others - are the most important gifts of the season. Be thankful tomorrow. Show unwavering gratitude for everything you receive, but even more gratitude for having friends and family around you. Hug everyone. Tell them how important they are and how much they mean to you. It may seem like such a small thing, but, in today's day and age of text messages and social media, the personal touch of a heartfelt hug and message goes a lot further than you may think. If there's one thing that I generally detest about social media, it's when people take to Twitter, Instagram, and Facebook to display their material good that they received. I don't have any sort of influence to tell people not to do this, and you're certainly welcome to disagree with my feelings towards this display or materialism. What I do appreciate is are the stories of giving, the stories of goodwill towards others, and seeing families - big and small - sharing dinner and smiles. In a lot of cases, we've allowed political differences, assumptions and biases, and general ignorance to separate us. Tomorrow is a day where we put those differences and beliefs aside to find harmony and common ground where we can share in happiness towards all. I know that I sound like I may have already been imbibing, but I assure you that I'm of sound mind. I just get sick of watching the news and seeing wedges driving sensible people apart over things that seem crazy. Be kind to one another today, tomorrow, and every day moving forward. It starts with family and friends, and can spiral outward from there. It starts with a heartfelt message and gratitude for one another, though, and that's the meaning of tomorrow. I'm not a religious or spiritual guy in any way, but I'll be here for hugs if you need one. That's my gift to all in this holiday season. If there's one thing that we, as humans, associate with holidays more than anything else, it's food. Turkey at Thanksgiving and Christmas, hot dogs and hamburgers during Canada Day and the Fourth of July, chocolcate on Valentine's Day - we have so many food options during the holidays and on observances that it's almost an automatic to expect good food when getting together with friends and family. The December holiday season often brings an abundance of food for us to devour with sweet treats being featured in the form of gingerbread, sugar cookies, and shortbread cookies. I, however, like the idea of a less-sweet treat, and while the cookies shown above have both sugar and chocolate chips, they feature a fruit not often found in your everyday cookies. Cranberries are often harvested late in the fall, making them ideal to serve at both Thanksgiving and Christmas. In the old days, people would string them with popcorn to give one's Christmas tree a festive, colorful look. The popularity of the berry for its ability to remain fresh for weeks after a harvest gave rise to it being served with Thanksgiving and Christmas dinners as the tartness of the berry when made into sauce would often serve to cut the richness of meats such as goose, duck, and turkey as well as providing a savory garnish to serve with glazed ham. While the recipe below calls for dried cranberries, the tartness of the cranberries still shines through in the cookie. I tend to like a less-sweet cookie on the whole as I don't have an extremely sweet tooth as it is, and with the white chocolate chips as part of the cookie they serve to look more festive than "anytime" cookies. Here's the recipe for Cranberry-White Chocolate Chip Cookies. Cream the butter, sugars, eggs, and vanilla in a large mixing bowl by using an electric mixer on high speed. Make sure your butter is soft enough to not leave lumps of butter! If you have to, pop it in the microwave before mixing so that it's soft without having melted. Mix the flour, oats, baking power, baking soda, salt, and cinnamon in another bowl. Stir until dry ingredients are mixed well. Stir the dry ingredients into the wet ingredients. Note that this will make a very thick dough, so be prepared for a workout! Once mixed in, add the cranberries, walnuts, and chocolate chips until all three are evenly distributed throughout the dough. Using a spoon and your fingers, make golf ball-sized balls of dough (or slightly smaller) with your hands, and place them approximately two inches apart on a lined baking sheet. Bake for 16-18 minutes until the edges of the cookies begin to brown. Remove from the oven, and allow them to cool for 15 minutes. This mixture will yield approximately two dozen cookies! You'll notice that the outside of the cookie becomes hard. This is normal! The cookies themselves will develop this outer "shell", but the interior of the cookies will be soft. Store in airtight containers and freeze, or leave on the counter for up to two weeks (if they last that long). As the Jets and Canucks battled, I made four dozen cookies for the family bake exchange, so there will be lots of these cookies to go around on Christmas morning. As I said above, they're not overly sweet when it comes to cookies, but there's still that cookie taste that one can't deny. If you want to make some unique cookies this holiday season, I find one can't go wrong with these! I was doing a little channel-surfing tonight as I waited for the Jets-Canucks game from Vancouver to start. I landed on the Anaheim-Buffalo game for a few moments and caught the familiar voice of long-time play-by-play broadcaster Rick Jeanneret in the first period. Jeanneret's iconic voice and call are as familiar as Bob Cole's or Doc Emrick's, but it's the way he goes from being calm to being overly-excited when making a call that has me appreciating his work. His iconic calls are some of the best in hockey history, and it's hard to imagine him not calling the Buffalo Sabres when they play. As I continued to look for something entertaining to watch - sorry, Anaheim and Buffalo - I didn't go back to this particular game. Instead, I landed on something else and watched that as I counted down the minutes until the Jets and Canucks took to the ice. Frankly, it's a good thing I didn't go back because there were some scary moments in the press box regarding the health of Rick Jeanneret in the third period. Why is Rob Ray doing play-by-play all of a sudden ??? As you can imagine, there was confusion and concern all over social media as it appeared that Rick Jeanneret was in some kind of trouble. There were periods of long gaps between him calling the game, and the plays he did call sounded like he was struggling in some way. And then this tweet popped up. Look, I have zero affiliation with the Buffalo Sabres. I don't own a jersey, I don't own any merchandise, and I've been to any of their games whether they be in Buffalo or on the road. What I do know is that Rick Jeanneret's health, especially at this time of year, is of the highest importance regardless of whether Buffalo beats Anaheim tonight. The Sabres were reportedly going to issue an update on Jeanneret's health after the game, but it seems that news was slow to trickle back to the arena on Buffalo's beloved broadcaster. My thoughts, prayers, and best wishes are with Rick Jeanneret and his family tonight as doctors work to help him with whatever is ailing him. When it comes to health, hockey can take a backseat. Here's hoping Rick Jeanneret is fine and returns to the broadcast booth soon. More importantly, here's hoping he'll be at home for Christmas where he belongs. 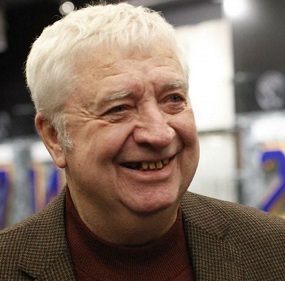 UPDATE: According to the Sabres on Sunday, Rick Jeanneret "is resting and doing well". That's excellent news, and here's hoping we get to hear one of his iconic calls soon. In the meantime, let's just hope that Rick Jeanneret gets the rest he needs to be back at 100%! I'm pretty certain that dinosaurs don't celebrate Christmas. I could be wrong, but I have yet to see a paleontologist dig up a set of dinosaur bones wearing a Santa toque. Outside of Barney the Dinosaur, I also doubt that any dinosaurs knew Christmas carols or even cared about them as well. However, if you're a Canada West hockey team named the Dinos, it seems that the Dinos' marketing team wanted the women's hockey team to show a little Christmas spirit after exams were over and the holiday season was upon us. To be honest, I'm not sure that any of the players featured in the video below wanted to take part from their reactions to being asked to participate. However, all were good sports and had some fun with it including goaltender Kelsey Roberts who has yet to deke anyone in Canada West hockey. Here are the Calgary Dinos women's hockey team serenading you with their version of the holiday tune "Jingle Bells". Not bad, right? Some may have a second career in entertainment with the way they carried a tune. I do appreciate that Calgary got one of their two game-winning goal scorers to sing the line about scoring the winning goal tonight as Delaney Frey has a game-winner on the season! The other choice would have been Rachel Paul, but she got the line about her teammates skating full speed a few moments earlier. Either way, good on the Dinos women's hockey team for having a little fun and spreading a little cheer this holiday season! I'm not saying they need a Christmas miracle to make the Canada West playoffs right now, but they're going to have to work as hard as Santa Claus if they hope to make it a reality. The Hockey Show, Canada's only campus-produced radio show that strictly talks hockey, returns tonight with a part-time Beans and three important figures on Bisons Sports' roster. Beans will be around for half the show tonight as he has an appointment he needs to get to this evening, and we're not going to make him late for said appointment. However, the three men we're featuring tonight are important cogs in the production of Bisons Sports broadcasts on Canada West TV! We'll talk to them about what goes into getting the broadcasts off the ground plus a whole lot more! 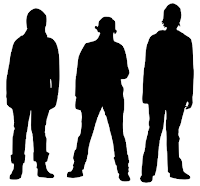 The three men who will join us also have a history with UMFM, so it'll be like getting the gang back together. The first man is Mike Still, writer and host for Bisons Sports and events, and he used to be part of the UMFM family when he co-hosted a show on the station. The second man is a fantastic radio host who currently occupies the Wednesday timeslot from 6pm to 6:30pm as Neil Noonan from Game of Runs joins us under his Bisons Sports role of webcast coordinator! The third guest is the guy who keeps us all sane as he handles all the social media and regular media requests as John Gaudes joins us as well! Together, these three men are the guys who produce most of the Canada West broadcasts of Bisons Sports as well as doing a lot of the YouTube, Twitter, Instagram, and Facebook stuff you may see on social media platforms. We'll talk to them about all their responsibilities, how basketball and football are their favorite sports, and more tonight at 5:30pm! Tonight, Teebz and Beans welcome Mike Still, Neil Noonan, and John Gaudes to the show where we'll talk Bisons Sports, Canada West broadcasts, future ideas for the broadcasts, their everyday jobs, how they put everything together week after week, and much more only on The Hockey Show found exclusively on 101.5 UMFM, on the UMFM app, on the UMFM.com web stream! Most U SPORTS women's hockey programs like to have an insurance policy when it comes to netminding. Normally, you see two goalies who share time in the net with the veteran goaltender often getting the majority of the playing time. Rookie netminders routinely see time in practice in their first year as a redshirt so that they don't burn a year of their eligibility in playing unless they are a blue-chip prospect such as Lauren Taraschuk was for Manitoba and Carmen Lasis was for Western last season. Or, in this case, as Halle Oswald has been for Alberta this season, pushing her way into the mix alongside Dayna Owen and Kirsten Chamberlin in the Alberta Pandas' crease. Quinn Phillips of Global News Edmonton decided to dig into the three-woman rotation a little in her report on the Pandas' shared goaltending responsibilities, and her report shows how a little friendly competition between three outstanding women has pushed the Pandas to greater heights this season. Make no mistake in how important Halle Oswald, the Manitoba-born netminder, has been in her rookie season for the Pandas. She's 4-1-0 on the season with a 0.53 GAA and a .966 save percentage to go along with her four shutouts. She was invited to Hockey Canada's Strength and Conditioning Camp while being a standout goaltender with the Pembina Valley Hawks, and she's continued to impress at the Canada West level with her play. If one is needing a candidate for Canada West Rookie of the Year, Oswald will certainly be in the mix alongside Mount Royal's Breanne Trotter. I don't know if Alberta has ever seen goaltending of this caliber from a rookie netminder, but Oswald is certainly putting the country on notice with her amazing numbers. The woman who finished last season as the goalie of choice for Howie Draper was Kirsten Chamberlin, and she's been just as good. Chamberlin is 5-0-0 with a 0.44 GAA and a .970 save percentage to compliment her three shutouts. Chamberlin, if you recall, was in the net against Manitoba in the heartbreaking 1-0 loss in Game Three of the Canada West semi-final last season, and she was rather incredible throughout that entire series despite falling one save short of Alberta's goal. If there's a goaltender who understands this push through friendly competition between the netminders, it's Chamberlin after she pushed her way to the starting role with her play last season. The veteran goaltender who seems to have accepted that there will always be competition in the crease is Dayna Owen, and her season is going rather nicely as well. Owen has compiled a 4-2-0 record with a 0.98 GAA and a .928 save percentage with two shutouts thus far. While Owen was forced to watch a lot of games from the bench behind Lindsey Post, one would have to think that she wants a chance to play more as Phillips reported in her piece. The nice part is that Owen, for the lack of time she has been getting this season, has risen to the challenge of her two younger colleagues and is playing the best hockey of her U SPORTS career. Alberta's defensive game has been rather impressive as well as they're averaging around 15 shots-against per game. That kind of defensive awareness has been buoyed by an aggressively checking team combined with some outstanding puck possession numbers that have limited their opposition's time in the Pandas' zone as well as keeping shots from getting to Oswald, Chamberlin, and Owen. If and when shots do get through, they're being covered and smothered by the three netminders, reducing rebound chances and second chances for teams as well. On top of their amazing defensive play is the fact that they do not take penalties. In 16 games thus far, the Pandas have surrendered just 32 power-play attempts to their opponents. They've only given up two power-play goals this season on those 32 times they were shorthanded, so whatever the Pandas are doing in their own zone has been nothing short of remarkable. If nothing else, the Alberta Pandas may end up rewriting the Canada West history books when it comes to defence and goaltending this season because of how they are defending their own zone. 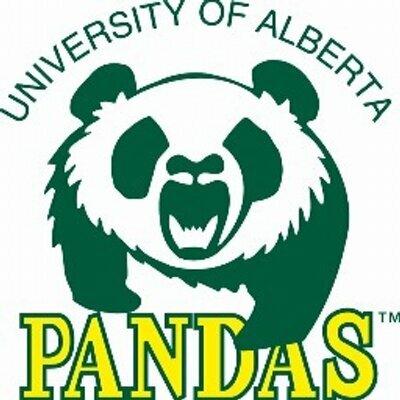 If the old saying of "defence wins championships" is true, the Alberta Pandas should be the favorites to win Canada West this season. And very large part of that defence comes from the three amazing women guarding the nets as the Pandas' last line of defence. The numbers don't lie - Oswald, Chamberlin, and Owen have been rock-solid! It's rather remarkable that we've seen goals scored by goaltenders in the AHL, the WHL as part of the Canadian Hockey League, and the NCAA already. There are a couple of leagues remaining where we had yet to see a goal scored in this season, but you can cross the USHL off that list because they joined the three leagues above tonight. That literally would only leave the ECHL and NHL as the two leagues in North America who have yet to see a goalie score this season, but it's only December. 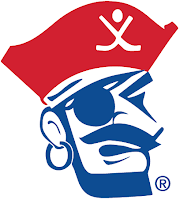 Again, I find it hard to believe that goaltenders are scoring at the rate they are this season, but the Des Moines Buccaneers became the latest team to see a goaltender add a goal to their total. With the Buccaneers holding a 1-0 lead over the Sioux Falls Stampede late in the game, goaltender Roman Durny decided to take a shot at the yawning cage after the Stampede opted to pull Alec Calvaruso with 59 seconds to play in order to get the extra attacker on the ice. Here's how that turned out. Durny, an Anaheim Ducks prospect, stopped the dump-in to the left of his net and launched the puck down the ice to score his first USHL goal at 19:31 to put Des Moines up 2-0! Calvaruso would return to the net for the final 29 seconds as the Buccaneers earned the 2-0 win while Durny scored the insurance marker while making 40 saves for the shutout! What makes Durny's goal even harder to believe is that this is the third season in a row where a USHL netminder has scored. Durny joins former Sioux Falls Stampede goalie Mikhail Berdin from last season and former Muskegon Lumberjacks goalie Keith Petruzzelli from two seasons ago as the USHL's streak for goalie goals continues! If you're keeping track at home, Tristan Jarry of the AHL's Wilkes-Barre/Scranton Penguins scored on November 14, Ian Scott of the WHL's Prince Albert Raiders scored on November 16, Atte Tolvanen of the NCAA's Northern Michigan University Wildcats scored on December 7, and Roman Durny made it another two-goal month for goaltenders by scoring tonight. I honestly cannot explain this offensive outburst from the masked men, but it's pretty impressive. Will we see an ECHL or NHL goalie join the club? Have it, netminders. Let's see what you got! 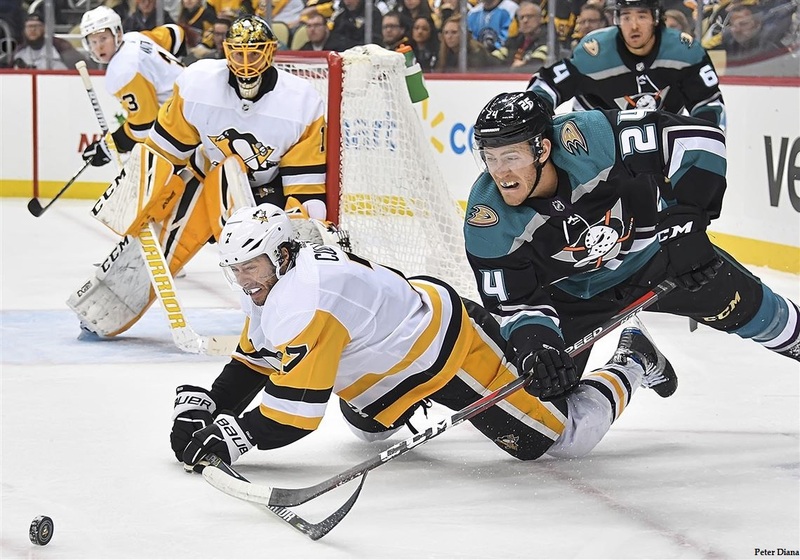 If you missed the game on Sportsnet tonight and weren't in Pittsburgh to see it live, the Penguins and Ducks flipped the script where the Penguins wore white at home while the Ducks wore their alternate throwback jerseys. In seeing the white jerseys at home, it made me yearn for the good ol' days when NHL teams wore white at home and colours on the road. I don't know what it is, but white at home is just the right look when it comes to hockey. If good guys wear white in cartoons and in westerns, I'll take more white at home in the future. Look, I understand the merchandising aspect of the NHL's switch to colours at home. Yes, they can push twice as many jerseys if fans in the stands and on TV see them since the vast majority of NHL alternate uniforms are coloured. However, with the emergence of the NHL on TV both regionally and nationally in the US and Canada, this aspect no longer can really be claimed as the primary reason for wearing coloured uniforms at home. Fans can watch nearly every game from the comfort of their own couch so they'd see every uniform their favourite team wears. While the NHL likely won't be changing their policy on uniforms due to one blogger's wishes, I would like to see them adopt a similar feature to what the AHL does but with a twist. The AHL, midway through the season, mandates that the teams switch from wearing colours to white or vice versa. Whatever the case, the NHL could take a page out of the AHL's book, but make it geared towards the playoffs. Instead of switching midway, switch from colours at home to white at home after the NHL All-Star break. This would give the NHL teams nearly two-thirds of the season to wear their coloured and alternate jerseys at home to help promote sales while the last third of the season would be about wearing white in the playoffs while at home. Some will say, "Teebz, you just want to see the Jets wearing white during the Whiteout," and I wouldn't disagree. However, the Whiteout is a beast unto itself. Case in point? Calgary's Sea of Red started when the Flames still wore white at home, and it hasn't affected how Calgarians embrace their playoff tradition. If everything holds true, the Sea of Red would be able to continue without interruption this season regardless of whether the Flames wear red, white, or fuchsia. Since every team breaks for All-Star Weekend, this wouldn't be some overnight switch for which half the travelling teams wouldn't have time to prepare. It's a simple swap, and teams who still want to a heritage night or whatever late in season could arrange that with the league and their opponents for a specific date. Some have joked that white jerseys should be worn at home as God intended, but I believe that some other force would be responsible for this change. Maybe some guy named Bettman. Maybe it's the collective group of NHL owners. Either way, seeing the Penguins in white at home against the Ducks was a sight that I've long coveted. I just need to see it more often. As we get nearer and nearer to the most commercialized holiday of them all, there are a couple of things that always get made around HBIC Headquarters. The first thing is always homemade Irish cream, and I'm pretty sure that this has become tradition around the holidays in both my home and my parents' home. It's just so good! The second thing has less to do with the holidays than one may expect, but the markets near me always seem to have the ingredients on sale right around this time of the year. I'm talking, of course, about the pictured snack above known as Chex Mix! Now I know you can buy Chex Mix rather than making it, but where's the fun in that? In saying this, I haven't perfected any sort of flavoured Chex Mix yet, but the traditional mix is fine with me. The nice part? This recipe yields a heckuva lot of Chex Mix which is perfect for holiday parties! It's up to you which version of Chex and Cheerios you use, but I prefer the Rice Chex as it gives a lighter party mix than the heavier Corn Chex does while the original Cheerios are much better for the mix than the multigrain Cheerios are. I also break the pretzel sticks in half so that they are easier to pick up in a handful than as a full stick, but feel free to use other shapes of pretzels if you prefer. In a large mixing bowl, mix all the dry ingredients together until you're happy with the results. In a separate container, whisk the butter, Worcestershire sauce, seasoning salt, garlic, and onion powders together. Drizzle one-third of the whisked liquid over cereal mixture and toss well to combine. Do this two more times - whisking the mixture befoe drizzling - until all of the whisked liquid has been added to the cereal mix. When ready, split the seasoned mixture onto two evenly-divided baking sheets. Bake for ten minutes with one tray on upper rack in oven and one tray on lower rack. Switch the two trays after the ten minutes for another ten-minute interval. Once fully baked, remove the trays from the oven and allow to cool. 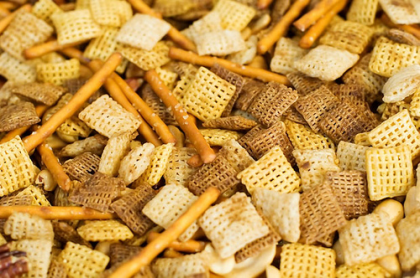 Store your Chex Mix in an airtight container. You might notice by the amount of cereal you're adding to the first bowl that you're going to end up with a lot of Chex Mix. This recipe will yield about 12 cups of Chex Mix while still leaving you lots of cereal left over for future batches of your own homemade Chex Mix. The nice part of this recipe is that you can cut the salt content if you want to reduce your sodium intake. You can add more Shreddies if you want to add some additional fiber. You can up the Cheerios amount for good heart health. You can cut the "bad fat" content by swapping the butter for a healthier oil such as canola oil. In short, you can make your homemade Chex Mix far healthier than the store-bought version marketed by General Mills. I made two batches of Chex Mix today, so I will have lots of Chex Mix to share with friends, snack on at work, and put out for parties. There's no shame in admitting that I prefer this to other snacks such as potato chips, so I'm going to enjoy this snack over the next couple of weeks. Here's hoping you do too! It's always bittersweet to see the teams who qualify to move from IIHF U20 Division 1 World Championship to the main tournament. Often, those teams have players who will have aged out of the tournament the following year when they make their appearance, likely making that team one of the two who play to avoid regulation. It's a bit of an unfair cycle, but this is the reality we live in when it comes to the promotion of teams for an annual tournament. The 2020 IIHF World Junior Championship will take place in Ostrava and Třinec, Czech Republic, and a familiar foe will return to the big tournament after winning the Division 1 tournament that took place over the last week in Fussen, Germany. And this team will have returning players who can participate next year as well! 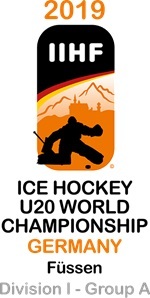 The six teams who competed in the 2019 IIHF U20 Division 1 World Championship in Fussen included host Germany, France, Latvia, Belarus, Norway, and Austria. Latvia and Belarus are often up and down in terms of being included in the top tournament, but Germany is always a surprise in needing promotion after years of success at the U20 level. They had struggled the last three years at this event, failing to gain promotion over countries like Denmark, Kazakhstan, and the Latvia. In 2020, the tournament in the Czech Republic will feature a German squad once more after they claimed promotion in their home country! It didn't look like this outcome would happen at the start of the week as Germany barely squeaked by Austria in a 3-2 shootout victory. Germany held a 2-1 lead through two periods before Austria tied the game, sending this one to overtime. With nothing solved there, the shootout was necessary. The two teams traded goals in Rounds Two and Four before Austria's Niklas Wurschl mishandled the puck in Round Five, setting up Germany for a possible win. Alexander Ehl made no mistake in beating Austria's Paul Mocher, and Germany claimed the shootout win for two points in the tournament. Perhaps that game against Austria was the wake-up call that Germany needed because they came out on December 10 and played some solid hockey in shutting out Norway by a 4-0 score. Taro Jentzsch, Tim Brunnhuber with a pair of goals, and Justin Schutz tallied all the offence for the Germans who limited the Norwegians to just 17 shots in the game compared to the 35 they fired at the Norway net. With the regulation-time win, Germany moved to five points, but still trailed the 2-0-0-0 Belorussians in the standings. December 12 saw Latvia as Germany's opponent, and this game was played much like the Norway game. Tim Brunnhuber, Nicolas Appendino, Marco Bassler, and Dennis Lobach staked Germany to the 4-0 lead before a late power-play goal by Latvia broke Hendrik Hane's shutout, but Germany still claimed the 4-1 victory. The victory kept the Germans on pace with Belarus who won their third-straight game with a 5-0 win over Austria, so it appeared that these two teams would decide the tournament when they met the very next day. Thursday's game showed just how ready Germany may be to take on the world's best. It was 3-0 within the first 12 minutes of the game for the Germans with Justin Schutz, Marco Bassler, and Tim Wohlgemuth scoring in a 4:38 span to put the Germans way out in front to end Andrei Grishenko's night in the Belorussian net at 11:54. The two teams would trade goals in the middle frame to put Germany ahead 4-1 before Dominik Bokk iced the game with 3:27 to play when he pushed the score to 5-1 with his goal. This victory all but guaranteed promotion as Germany moved to 3-0-1-0 while Belarus fell to 3-1-0-0. With one game left on the schedule, Germany needed just one point against France to guarantee themselves promotion to the top level in 2020 while Belarus needed to win and have France defeat Germany if they were to advance. Germany had the earlier game, so Belarus would find themselves scoreboard watching as the game began. The Germans would start the game off right with a power-play goal on their first opportunity from Yannik Valenti to make it 1-0 through 20 minutes of play. Nicolas Appendino made it 2-0 five minutes into the second period before Antonin Plagnat answered back with a power-play goal for France with seven minutes left in the period to make it 2-1. However, Taro Jentzsch restored the two-goal lead just 43 after the French goal to make it 3-1, and Belarus needed France to make a big push in the third period if they had any chance in being promoted. The only problem was that Germany was on a mission. Taro Jentzsch scored 2:29 into the period and added his third goal for the natural hat trick at 11:37 to make it a 5-1 game. Dennis Lobach added one more goal at 16:56, and the celebration was on as Germany downed France 6-1 to earn the promotion to the 2020 IIHF World Junior Championship! What's key for this team as they make their way back to the top level is that 10 of the 22 players who played in this tournament were born in 2000 or later meaning they'll be eligible to participate in next year's World Junior Championship. That will help Germany immensely as they look to stay in the top group for more than one tournament. Of the players who are eligible to return, they include goaltenders Henrik Hane and Florian Mnich, defenders Niklas Heinzinger, Leon Huttl, and Moritz Seider ('01), and forwards Justin Schutz, Dennis Lobach, Dominik Bokk, Taro Jentzsch, and Yannik Valenti. Yes, a number of those players played large parts in helping this German team get promoted, so it will be interesting to see how they fare next year against the world's best. Just as a note, the game between Belarus and Latvia that ended up meaning nothing was won by Latvia by a 3-1 score in which the Belorussians simply looked disinterested in playing. I feel for them, but there's still pride and country for which they should be playing. In the end, it seemed the disappointment of missing the chance to be promoted got the better of them. Congratulations to Germany on their victory and their promotion to the 2020 IIHF World Junior Championship in Ostrava and Třinec, Czech Republic! This might be the best holiday gift these kids have ever received as they can all start preparing for a guaranteed trip to the Czech Republic next Christmas, and I look forward to having Germany back at the big dance next year! If there's one thing that I see players across a number of sports trying to control, it's those beads of sweat that run down one's forehead and possibly into one's eyes. While we've heard the old adage of "Never let them see you sweat," it happens through body heat and effort as sweat is the body's way of trying to keep one cool. As you might expect, sweating happens while playing sports often, but what if I told you there was an affordable, effective product that can help athletes remain drier than normal while still achieving greatness? I'd like to introduce you today to NoSweat. NoSweat is a lifestyle brand and manufacturer of products that are 100% USA made and built to increase performance, safety and hygiene for anyone who sweats and wears some type of hat, helmet, visor or hard hat. Founded in 2008 by Justin Johnson and based out of Minneapolis, NoSweat offers a growing, patented line of sweat absorbing solutions. While this entry may seem like product placement, I assure you that I, along with a high-performance athlete, had a chance to test out a few of the NoSweat liners, and the science is pretty convincing. The NoSweat liners that I tested were worn in a couple of ball caps while I had Bisons women's hockey forward Jordyn Zacharias test the helmet liners as I went looking for these hat and helmet liners to fail in their claim where one can say goodbye to sweat. First, let's take a look at the pitch NoSweat makes. They call it "Dri-LID technology" in terms of the sweat absorption qualities, but there isn't much information on what's actually inside the NoSweat liner. That being said, I do know that the NoSweat liners are easy to install, keep one's forehead dry and one's hat from developing those unsightly sweat marks, and don't actually change the way the hat sit on one's head. In other words, they live to their claims. If there was one drawback in wearing the cap liners while shoveling snow, working around the house, and running errands, it's that the stickiness of the liner can start to fade after time, making a replacement necessary. I suppose that the glue used by NoSweat was never meant to be permanent in the first place, so if this is the only drawback in the product that I found I really have nothing to complain about in the overall review. NoSweat cap liners absorbed the sweat and oils on my forehead, kept my hat looking new, and were unobtrusive and unnoticeable in terms of wearing it. Beer league hockey sometimes doesn't give me the heavy sweating that I would see if I were a high-performance athlete, so I turned to Jordy of the Manitoba Bisons for a little help in testing the NoSweat helmet liners. While she claimed she only "glowed" while playing and practicing, she said, "The NoSweat liners absorbed the sweat well, and I never noticed any sweat rolling down my forehead while playing. I don't recall needing to wipe my brow with a towel in between drills, so the NoSweat liners work." A solid review from Jordy, but the question of whether she would use them again needed to be answered. "Yeah," she stated, "I didn't even notice them while practicing, so I'd use them again. They did the job they were supposed to do and they didn't affect my play in any way, so I'd use the NoSweat liner again." I found it interesting that Washington Capitals star TJ Oshie was one of the brand ambassadors for NoSweat. Along with Oshie, Golden Tate of the NFL's Philadelphia Eagles, Dallas Keuchel of MLB's Houston Astros, Brandon McManus of the NFL's Denver Broncos, PGA stars Stewart Cink and Scott Langley, Matt Adams of MLB's St. Louis Cardinals, and tennis broadcaster Kerry Feirman all are brand ambassadors of the NoSweat product. NoSweat found its first professional alliance with the New York Rangers, and there are "now 27 teams who regularly wear the product in their helmets" as well as the "NHL Officials Association, who ordered over 21,000 of the Performance Liners for the 2017-2018 NHL season". They're also an officially licensed partner of the PGA Tour! With that kind of support, it's fairly clear that this product not only works, but is the only choice for all those who wear a hockey helmet at the NHL level! I've been using the NoSweat liner in my ball cap for the last three weeks, and it has delivered on every feature that the company promises. The additional cap liners I have will be used this summer while playing and umpiring baseball as I often find myself with a damp cap after being out in the heat all day. I have a feeling that NoSweat liners will keep my hat dry and comfortable all day long! You can purchase NoSweat liners at a number of retail outlets across North America or you can get them directly off the NoSweat website. They're priced at $5 USD for a three-pack of liners while a 12-pack will set you back $18 USD and a 25-pack will cost you $35. Honestly, for the low price NoSweat is charging for the liners, I would have guessed they would have been more expensive than their current price point. In saying that, the benefits are certainly worth the low cost of the liners, so I not only recommend them but I certainly can endorse them at their current prices! In recent news, it was announced that NoSweat entered a five-year international licensing agreement United Sports Brands, parent company of Shock Doctor, Nathan, McDavid, Cutters and XO Athletic! Expect to hear more and more about the NoSweat brand as they continue to grow and market themselves extremely well! If you find yourself drying your brow while playing sports or doing work, NoSweat liners should be part of your uniform. The cap and helmet liners absorb sweat and wick it away, keeping your hat or helmet and your forehead dry over the course of several games or weeks. With NoSweat's low prices, it's an incredible product that won't destroy your wallet. Because of its effectiveness and its pricing, NoSweat will be in my hockey bag and baseball bag going forward! The Hockey Show, Canada's only campus-produced radio show that strictly talks hockey, is back tonight with a number of things to discuss regarding hockey. We'll be joined by a very special guest who has more knowledge and skills in the hockey world than Beans and I combined, and we'll talk about everything that's been happening. It's always a privilege when this guest has time for us, so we'll use that time as best as we can to get the low-down on everything happening with her as well! See this goal? It was one of the featured first-half highlights from Bisons Sports, and Beans and I are proud, honoured, privileged, and humbled to welcome back to the show that player with all the right moves in Karissa Kirkup! We'll talk to Karissa about the season thus far, her work doing her teaching practicum, how her brother Tyler is doing at Bemidji State as a member of the men's hockey team, and some of the charitable and community stuff that the Bisons women's team is doing over the holiday season! After that, we'll break into discussing the National Women's Under-18 Championship awarded to Morden and Winkler, the colour-changing hockey puck being used by the NHL, Manitoba's first all-accessible rink at Dakota Community Centre and how Manitoba seems way behind on accessibility for all, ESPN examining the health inspector reports for the major four sports in North America, and more! It all starts tonight on UMFM at 5:30pm! Tonight, Teebz and Beans welcome Bisons sniper Karissa Kirkup to the show where they'll discuss life and hockey with Karissa before tackling a big tournament, a long-overdue rink, a seemingly-useless innovation in pucks, rather disgusting findings at stadiums and arenas, and much more only on The Hockey Show found exclusively on 101.5 UMFM, on the UMFM app, on the UMFM.com web stream! 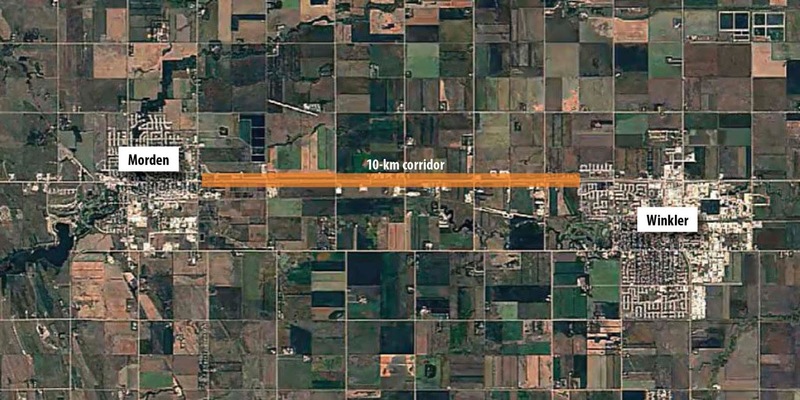 This is the larger overview of the communities of Morden and Winkler in Manitoba. It has long been a hockey hotbed for women's hockey with the Pembina Valley Hawks producing all sorts of high-level talent at the U SPORTS and NCAA levels. There's a couple of kids who call the area home who played in the NHL as Dustin Penner, Eric Fehr, and Justin Falk from nearby Snowflake, Manitoba all played in the area. The Hawks bantam female team routinely is in the mix regarding Manitoba's berth at the Esso Cup every year as the Hawks always produce solid teams, and it seems that Hockey Canada is rewarding these efforts with a major tournament next year! Hockey Canada announced today that the National Women's Under-18 Championship will be played in Manitoba for the first time in its history in the towns of Morden and Winkler! A tournament of this magnitude shouldn't really surprise anyone in and around the Morden area, though, as the town has successfully hosted the 2017 Esso Cup, Canada’s National Female Midget Championship, while the town of Winkler has been on the national sports map a numbers of times after hosting a very successful Hockey Day in Canada and being tapped for an upcoming Sportsnet Hometown Hockey weekend in March. Needless to say, these towns should be ready and willing when it comes to hosting the National Women's Under-18 Championship! "We welcome the chance to work with Winkler on hosting the National Women’s Under-18 Championship," Morden Mayor Brandon Burley said in a statement. "Although both communities are capable of hosting large-scale events on their own, we are stronger together. We are excited to have the opportunity to build on the success of the Esso Cup." While more news will develop as we get closer in terms of activities surrounding the games, which teams and officials will be participating, and more, I can honestly say that I will likely be booking some holidays off work to see if I can take The Hockey Show on the road for a few days down to Morden and Winkler. I love visiting the area, the community is incredible, and the hockey action will be great. Expect HBIC, if nothing else, to have reports on the action during the tournament as I apply for media credentials. All in all, it looks like 2019 will be another solid year for women's hockey in Manitoba with Hockey Canada awarding the National Women's Under-18 Championship to Morden and Winkler. I, for one, am already excited for the tournament, and I'm hoping that Morden and Winkler continue their proven track record of putting on events that rank second to none! The man to the left is NHL referee Tim Peel. Tim has never played in the NHL, but it took a weird bounce tonight for him to score his first NHL goal. Technically, he won't get credit, but let's be honest in saying that sometimes the ugliest goals are the most memorable. In tonight's game between the visiting Florida Panthers and the St. Louis Blues, it was tied early in the first period when Tim Peel beat Panthers netminder Roberto Luongo with a solid deflection for which I believe neither Peel nor Luongo were ready. I'm not sure if Peel is a Blues fan having been born in Hampton, New Brunswick, but I can't imagine he was feeling too hot after scoring his first goal in over 1250 NHL games in the way that he did. Here's the video of Peel's first NHL goal. So while it appeared that Robert Bortuzzo was set to be awarded the goal, the officials made the correct call in denying Bortuzzo his second goal of the season after it deflected off Peel in the corner and all the way to the middle of the ice. I can understand why Peel was shaken up - that's a long way for that puck to travel off the midsection of an unsuspecting official. How often does one see that play? Well, it happened to Calvin De Haan last season while with the Hurricanes against the Bruins when a puck deflected into the net off Francois St. Laurent. This goal, too, was disallowed. In other words, it happens enough for a rule to be written, but not often enough that remember the last time it happened. 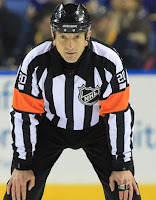 In any case, the NHL officials are doing their jobs well in knowing the rules. And it seemed like Tim Peel was well out of the way of that dump-in by Bortuzzo, but it just goes to show you that you should never take your eye off the puck as a fan or an official. Colour-changing items based on temperature isn't something new. 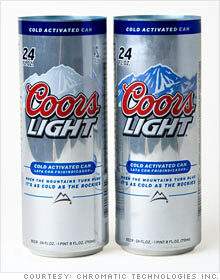 We've seen it used in mugs that change their images and colours when filled with hot beverages, we've seen Hypercolor clothing that changed colours with body heat, and we've seen the pictured Coors Light cans that show the mountains in blue when the can is cold enough. Even the British got in on the fun when they created stamps that changed from a gray sky to a blue sky in 2001! This technology has been around for a number of years, but it's 2018 which means that the NHL finally has jumped onboard with this decades-old colour-changing technology. The NHL announced today that the "official game pucks featuring thermochromic coatings supplied by PPG will be in play in the 2019 Bridgestone NHL Winter Classic" so that the officials know when a puck is no longer frozen and needs to be swapped out for a new, frozen one. Welcome to 1991, folks. I use the 1991 year sarcastically because that was the year that Hypercolor clothing, containing thermochromes, was introduced to the world. Yes, I had a shirt back in grade school, but it quickly lost its appeal once the thermochromic effect was killed off by washing the shirt. On other words, you were either cool and had body odour or you had a non-working Hypercolor t-shirt and smelled fresh. I opted for the latter. What makes this development by the NHL interesting is that the NHL was worried about the screening causing adhesion to the ice. Thermochromic coatings supplied by PPG meet the NHL's requirements for withstanding game-environment impacts and low temperatures without impacting adhesion. The coating is dispersed into an ink system and screen printed directly onto an official NHL game puck. Because adhesion to the ice surface should be the biggest worry when thinking about outdoor games and the possibility of melting ice due to the heat? If the thermochromic puck gets too warm, the NHL logo on the back of the puck will go "clear", signalling to the officials that the puck needs to be changed. This is a greater concern than adhesion since we've seen a number of Winter Classic games with pucks that look more like bouncy rubber balls than hockey pucks. Dan Craig, the NHL Vice President of Facilities Operations, stated, "Freezing a puck eliminates bouncing, and game officials closely monitor the puck for temperature changes that affect performance while in play. A coating that changes color when the puck is above freezing will more accurately alert the officials that it is time for a replacement." It's funny that the NHL just came up with this concept now considering there have been patents on this idea for years. Chromatic Technologies Incorporated is the company that allowed Coors Light cans to be thermally-regulated, and they've been working with the beer giant - one of the NHL's iconic sponsors for marquee events - for some time. It's almost as if the NHL is simply ignorant to solutions in other industries when it comes to solving their own problems. In any case, it will be interesting to see how often the NHL changes out the puck based on how warm it is during the Winter Classic, how often the puck is handled by players and officials (hello, body heat! 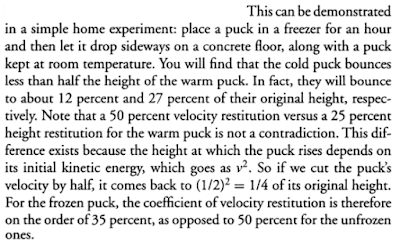 ), how often it's lying on the ice (it should be colder), and how these pucks actually react if its warm when it comes to bouncing. If the screening on the bottom stays cold because it's being slid across cold ice, do the actual physical properties of rubber change (hint: no)? What bothers me more is that if these pucks are single-use like Coors Light beer cans are, this seems like an awful lot of science going into something where an average of 12 pucks per game are being used. 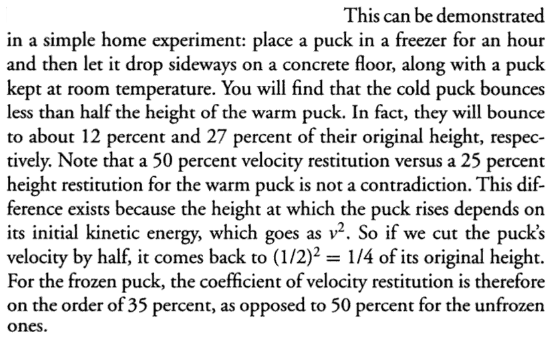 The NHL doesn't recover these pucks when they're shot into the crowd, so this seems like a ridiculous gimmick for something for which science should have already have an answer. And it does thanks to Alain Haché! Look, I'm all for making the games better. Outdoor games are already a gimmick, and adding a colour-changing puck is just another gimmick within a gimmick. Like the FoxTrax puck, this idea, in its infancy, seems like a good idea, but the overall use in a long-term trial seems limited in its scope and depth. If these pucks are going to be used and sold as collector's items, I understand the merchandising effect of this, but using them indoors where 99.9% of all NHL games are played would be dumb at its very best. If it's warm outside, the officials should be swapping out pucks as often as they can - that's just common sense. If it's sunny and cold, the officials should keep an eye on how the pucks are moving on the ice with respect to the black rubber absorbing the sun's heat. If it's cloudy and warm, the same respect should be given with the black rubber absorbing the heat from the environment. 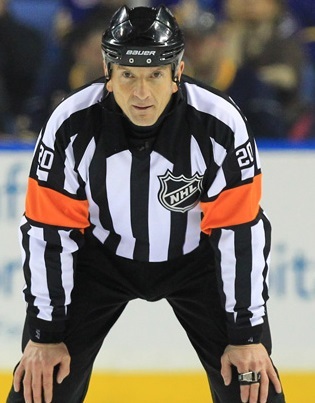 In the end, the officials are competent enough to do their job without a screen-printed thermometer on the puck that they have to check every time they pick the puck up. The NHL loves its gimmicks. Get ready for another one.